Most fawns are born by the last week in May — into the first week or two of June. There are always early-birds and late bloomers. The key here is the abundance of forage for does to consume and produce milk and ultimately — a healthy fawn. Fawns begin nursing immediately and continue to nurse throughout the warmer months. Most fawns are completely weened by September. Every now and then you may notice a fawn during the fall trying to nurse, but adult does normally aren’t very receptive and the fawns are able to digest forage by September. You can start seeing the beginnings of the racks by mid June. By the end of July it’s much easier to see what the buck will likely be (main frame 8-pointer, 10-pointer, etc.) by late August the rack is basically fully grown. Most velvet sheds in early September. In all the years I’ve hunted, photographed and filmed whitetails, it seems the antler shedding may begin as early as the last week of August, but the bulk occurs the first week of September. 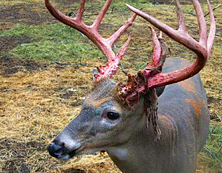 By mid September (normally opening day of bow season) the majority of bucks have shed their velvet. Every now and then you may see a buck with velvet but consider it fairly uncommon. Most fawns shed their spots the first couple weeks into September. Adult deer are also transitioning from their orange-colored summer coats into their thicker, darker fall coats. The transition can occur anywhere from late August into early September. However by mid September most coat changes are complete. 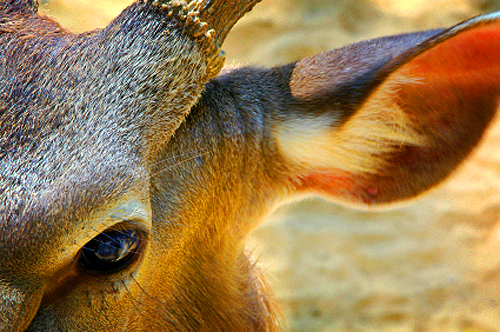 Deer begin to get more independent in August. Most buck groups disband by the last week of August to first week of September. 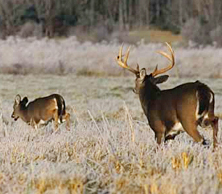 Aside from velvet shedding rubs, the first rut-related rubs of the season begin to pop up around the 15th of October and increase into the end of the month. Rubs are continually made, visited and refreshed throughout November, with varying degree of activity due to rut phases and conditions. Typically linked in occurrence to rubs, these markers begin to pop up the last couple weeks in October and can increase in frequency into November. In the areas that I hunt in Northern Minnesota, I almost always find the season’s first rubs before I find scrapes. These can vary every year depending on different factors such as deer density, buck to doe ratio, weather, moon phase timing and hunting pressure but overall the days and occurrences are normally very close from season to season. 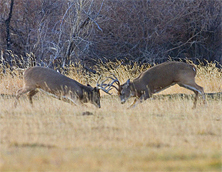 can even last into December, sometimes with a large deer heard and abundance of food, a second, less aggressive rut takes place. Often young does are bred during this time. It’s also important to note here that when an adult doe reaches estrous, it lasts for around 36 hours while the entire breeding phase of the rut can last for many days given the fact that more than one doe enters estrous. Can depend on region and weather. Normally deer focus heavily on food sources after the rut into winter and really hit the food hard after the first major drop in temperatures and/or first major snowfall. 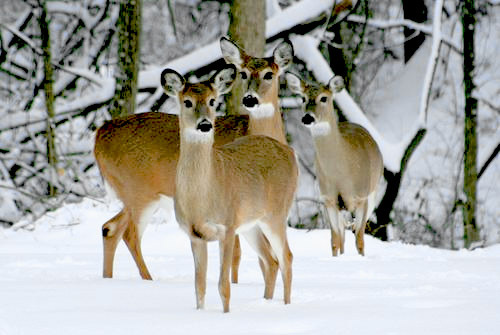 In northern Minnesota most deer begin to consistently focusing on food sources by the first two weeks of December. This behavior continues throughout winter, as food becomes the main drive. When it comes to late season hunting the way to a buck is through his stomach! Can depend on climate and availability of food. Sometimes bucks lose their antlers as early as late December and I’ve even watched deer keep their headgear into late March. This is not common however and the majority of antlers are shed mid to late January into February. To say this season has been odd — would be an understatement! The early season’s weather made hunting conditions, in many areas, less than ideal. This left a lot of folks banking on the rut, which ultimately fell pretty flat for many hopeful hunters. The 2010 deer season has been a head-scratcher. Even so, we have been fortunate this year. We’ve had steady deer activity despite very unusual patterns all season. Chasin’ Tail team competes with thick ice and snow for big bucks. Congratulation Matt for being in the right place — at the right time! 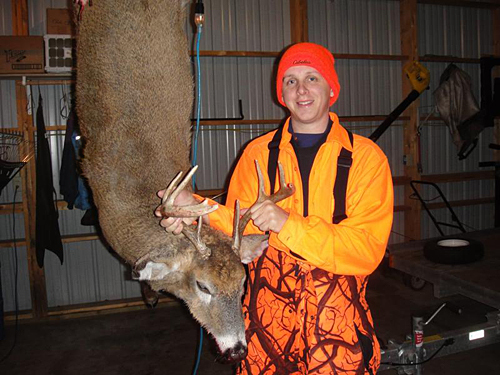 A Guide to Hunting Whitetail Bucks in Rut! Scouting for The Best Trail Camera? I’ve been chasing this particular buck for a number of years now, and I’ve never quite been able to close the deal with him. Had a number of close calls. (notice my stand about 20 yards behind the deer!) This pic was taken when the buck was 3-1/2. He’ll be 5-1/2 years old this year, so I’m sure he’ll be as big and cagey as ever! 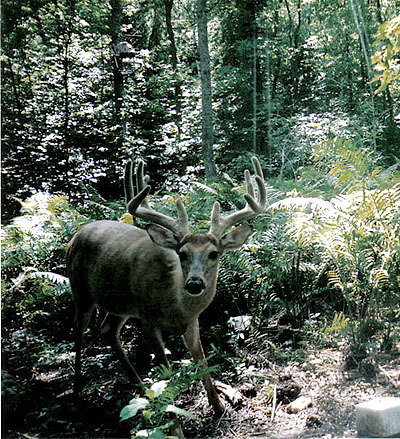 We have a number of bucks around that definitely carry the same genes….trail cams are so much fun! If you’re a deer hunter, you’d have to be living under a rock not to have noticed the trail camera craze of recent years! Because of their unparalleled scouting benefits trail cams have made any self-respecting whitetail addict’s gear bag incomplete without them. Scouting cameras have evolved from simple trail counters to 35mm cameras, and into today’s efficient and advanced digital trail cameras with a multitude of features. The simple fact is that trail cameras have truly revolutionized the way we hunt and scout. Because of them, we can keep a keen eye on the prize 24-hours a day, 365 days a year! If you haven’t yet taken advantage of both the fun and the benefits of trail cameras, you’re missing out! There is no question that because of increased popularity, an ever-increasing amount of companies within the hunting industry are throwing their hats in the ring. There are so many manufacturers and different features it’s easy to experience camera confusion and making a choice can be overwhelming. There is a wide range of varying features and as you can expect, prices.